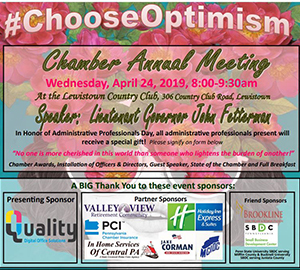 You are invited to join us for the Chamber’s Annual Meeting Featuring Lt. Governor John Fetterman and the Chamber Annual Awards! 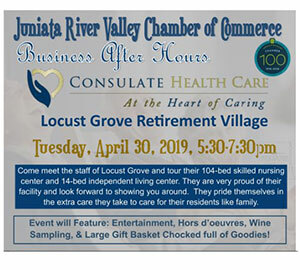 Come meet the staff of Locust Grove and tour their 104-bed skilled nursing center and 14-bed independent living center. They are very proud of their facility and look forward to showing you around. They pride themselves in the extra care they take to care for their residents like family. Event will Feature: Entertainment, Hors d’oeuvres, Wine Sampling, & Large Gift Basket Chocked full of Goodies! 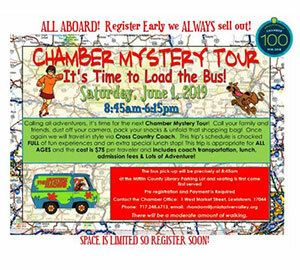 Calling all adventurers, it’s time for the next Chamber Mystery Tour! Call your family and friends, dust off your camera, pack your snacks & unfold that shopping bag! Once again we will travel in style via Cross Country Coach. This trip’s schedule is chocked FULL of fun experiences and an extra special lunch stop! This trip is appropriate for ALL AGES and the cost is $75 per traveler and includes coach transportation, lunch, admission fees & Lots of Adventure! 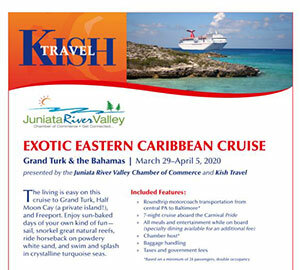 The living is easy on this cruise to Grand Turk, Half Moon Cay (a private island! ), and Freeport. Enjoy sun-baked days of your own kind of fun— sail, snorkel great natural reefs, ride horseback on powdery white sand, and swim and splash in crystalline turquoise seas.